Home > Understanding Art > Questionnaire: Can You Read a Painting? Art is often perceived to be exclusive, intimidating and out of reach for many people. The problem seems to lie with a simple confusion which is easily overcome. Art experts study their field of interest for years, dissecting paintings in minute detail. People mistakenly perceive this to be the level of education and knowledge needed to properly appreciate a painting. 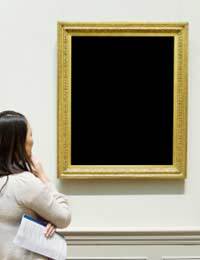 This is entirely misguided; a painting was created to court ‘the eye of the beholder’, literally! When the artist put his brush to canvas, he was appealing to simple human emotion and perception. It’s possible to ‘read’ a painting. By answering a simple set of questions, the viewer can gain the maximum pleasure and appreciation from the painting. Never underestimate the power of first impressions; they are your instinctive reactions, untainted by cultural bias or prejudice. What is the environment like where the painting is hung? How does it make you feel? When you first look at the painting, what emotions do you experience? Does it seem to mean anything to you? How has the artist painted the picture? When you have formulated your first impressions, it’s time to stand back and look at the painting in greater detail. Now ask the questions again and fine tune your responses. Perhaps your first impressions will remain unchanged or you may have new ideas and reactions. Does the painting inspire a positive or negative emotional response? Look at the painting in its entirety and decide the emotions the artist was trying to inspire. It’s important to remember that a painting was never meant to ‘mean’ something. Art is more subtle, the artist suggests things but leaves the rest to the viewer. This question is the viewer’s opportunity to evaluate the work superficially and grade it on a personal level. It often generates the strongest responses. Some people love or hate works of art on first glance. Put simply, this question asks you to describe what you see. What was the artist painting? Abstract (in which case it may be tricky to determine what the subject of the painting is. You will need to investigate and ‘read’ the painter on deeper levels). Are there any Clues or Symbols? Artists are often very fond at using symbolism within their art. Sometimes, the symbols are quite obvious and need little explanation. Others however are cryptic. They may be part of a visual joke to convey an alternative meaning. Some examples of documented symbols include the human skull for death, the Roman God, Cupid, represents love and the use of the three-leaved clover represents the Holy Trinity. How did the Artist Create the Painting? This question examines the style of the work of art. It raises so many questions and concepts about effects and techniques commonly used in art. How is colour used and what effects does it create? The balance and grouping of the painting. Does it lead the eye to a particular part of the composition? The use of space and light. Are any images brought forward, placed in the background or highlighted by use of shade and light. Does the painting have depth or even a 3D effect? How and why has the artist done this? What techniques has the artist used? Has this been done to create a feeling or effect? Look at whether lines are distinct or suggestive giving an impressionist feel. There is only one way to fully appreciate art. Remember that the artist was speaking to you - not the experts! Trust human instinct and the talented ability of the artist to appeal directly to the individual consciousness and emotions.